This is our 11th tutorial of Learning PIC microcontrollers using MPLAB and XC8. In this tutorial we will learn How to control Servo Motor with PIC Microcontroller. If you have already worked with Servo motors you can skip the first half of this tutorial but if you are new to servo motor itself then continue reading. Till now, we have covered many basic tutorials like LED blinking with PIC, Timers in PIC, interfacing LCD, interfacing 7-segment, ADC using PIC etc. If you are an absolute beginner, then please visit the complete list of PIC tutorials here and start learning. In our previous tutorial we learnt how to generate PWM signals using PIC Microcontroller, the signals were generated based on the value read from the potentiometer. If you have understood all programs then, Congratulations you have already coded for a Servo motor also. YES, Servo motors respond to the PWM signals (which we create using timers here) we will learn why and how in this tutorial. We will simulate and build the hardware setup for this project and you can find the detailed Video at the end of this Tutorial. A Servo Motor is a type of actuator (mostly circular) that allows angular control. There are many types of Servo motors available but in this tutorial let us concentrate on the hobby servo motors shown below. Hobby servos are a popular because they are the inexpensive method of motion control. They provide an off-the-shelf solution for most of the R/C and robotic hobbyist's needs. They also eliminate the need to custom design a control system for each application. Most of the hobby servo motors have a rotational angel of 0- 180° but you can also get 360° servo motor if you’re interested. This tutorial uses a 0- 180° servo motor. There are two types of Servo motors based on the gear, one is the Plastic Gear Servo Motor and the other is Metal Gear Servo Motor. Metal gear is used in places where the motor is subjected to more wear and tear, but it comes only at a high price. Servo motors are rated in kg/cm (kilogram per centimetre) most hobby servo motors are rated at 3kg/cm or 6kg/cm or 12kg/cm. This kg/cm tells you how much weight your servo motor can lift at a particular distance. For example: A 6kg/cm Servo motor should be able to lift 6kg if the load is suspended 1cm away from the motors shaft, the greater the distance the lesser the weight carrying capacity. Learn here the Basics of Servo motor. The colour coding of your servo motor might differ hence check for your respective datasheet. Each servo motor operates on a different PWM frequencies (most common frequency is 50HZ which is used in this tutorial) so get the datasheet of your motor to check the on which PWM period your Servo motor works. The details on the PWM signal for our Tower pro MG995 is shown below. From this we can conclude that our motor works with a PWM Period of 20ms (50Hz). So the frequency of our PWM signal should be set to 50Hz. The frequency of the PWM that we had set in our previous tutorial was 5 KHz, using the same will not help us here. But, we have a problem here. The PIC16F877A cannot generate low frequency PWM signals using the CCP module. According to the datasheet the lowest possible value that can be set for the PWM frequency is 1.2 KHz. So we have to drop the idea of using CCP module and find a way to make our own PWM signals. Hence, in this tutorial we will use the timer module to generate the PWM signals with 50Hz frequency and vary their duty cycle to control the angel of the servo motor. If you are new to timers or ADC with PIC please fall back to this tutorial, because I will be skipping most of the stuff since we have already covered them there. We initialize our Timer module with a prescaler of 32 and make it overflow for every 1us. According to our data sheet the PWM should have a period of 20ms only. So our on time and off time together should be exactly be equal to 20ms. So inside our interrupt routine function, we turn on the pin RB0 for the specified time and turn it off for the reaming time (20ms – on_time). The value of the on time can be specified by using the Potentiometer and ADC module. The interrupt is shown below. Inside our while loop we just read the value of potentiometer by using the ADC module and update the on time of the PWM using the read value. This way we have created a PWM signal who’s Period is 20ms and has a variable duty cycle which can be set using a Potentiometer. Complete Code has been given below in code section. Now, let’s verify the output using proteus simulation and proceed to our hardware. If you have already come across the PWM tutorial then the schematics of this tutorial will be same except for which we will be adding a servo motor in place of the LED light. With the help of Proteus simulation we can verify the PWM signal using a oscilloscope and also check the rotating angel of the Servo motor. Few snapshots of the simulation is shown below, where the rotating angel of the servo motor and PWM duty cycle can be noticed to get changed based on the potentiometer. Further check the Full Video, of rotation at different PWM, at the end. As we can see the servo rotation angel gets changed based on the potentiometer value. Now let us proceed to our hardware setup. In the hardware setup we have just removed the LED board and added the Servo motor as shown in the schematics above. The video below shows how the servo motor reacts to the various positions of the potentiometer. That is it!! 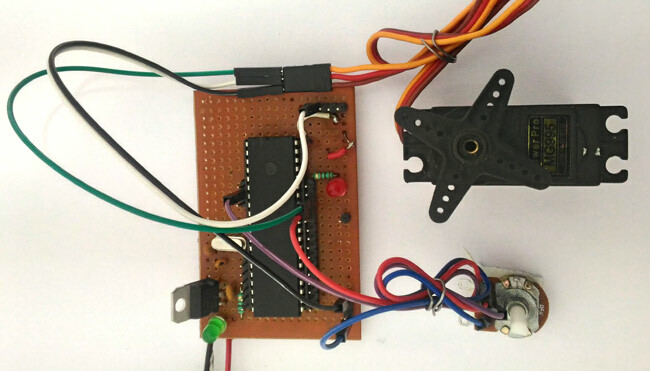 We have interfaced a servo motor with a PIC Microcontroller, now you can use your own creativity and find out applications for this. There are lots of projects out there which use a servo motor. Look at for which value if 0n_time the servo reaches -90,0 or 90 and find its corresponding vale. IF you theoretically wanna calculate the value of TMR0 its beyond the scope of this tutorial. As I can change the pot door, as for example the pot is in the RA5 port, I was wondering if there is any way I can put it on the RA4 port. Has as? Hi i have converted your code to mikroc but its not working for me, i dont understand were 252 came from and the why are you multiplying 0.039 on the analogue value? Sorry for confusing you a bit there!! We have initialized the values 251 in the register TMR0 (TMR0 = 251; ), so at timer over flows for every 1us. The value 1us is not mandatory it can be anywhere above 20ms. Now every time the timer over flows we have to load the same value + 1 into the TMR0 register, that is we have to load 252 inside TMR0 since there will be one additional instruction cycle during reinitializing. The function ADCRead(4) will give us a value between (0-1024) it is multiplied with 0.039 so that we map them from 0-40. By doing so the variable on_time will vary from 130 to 170. Where 130 will position the servo at 0* and 170 will position it at 180*. ok thats very helpful. my other question is how do you know that 130 is the 0 position and 170 is the 180 position (im using a 90 degree servo so it should be fine too right?) i also dont quite understand the bit where you use the 200 value. should not be 170 in this case? Hi this is still not working, any chance you could help? Sure we can help, but only if you state your question in detail. What problem are you actually facing? Yes, The code is also applicable for a 90* Servo, provided the PWM period is 20ms. Check your datasheet to confirm it. The value 130 and 170 was obtained through experimentation. could you please explain me the ISR in this case or at least where did you calculate the 50 Hz signal? Thanks in advance!!!!!! To know this you should under stand what kind of input is required for a servo motor to work. Take a look at the following picture. Well its very simple. There are two ways using which you can generate a PWM signal in PIC microcontroller. The most used and conventional way is using the CCP modules. But they cannot produce low range requires like 50Hz so for these we use timers. In this project I have used timers as well and ence will explain the same. Sir, may I know the overall components and it's diagram for pcb? Could it be possible to control 4 servo motors with this same idea? If it is could you give me an example or tell me how? Thanks a lot!! Hi! I need your help. I'm planning on driving 3 servos but you mention that "if you are planning to use more than two servo motors a proper servo shield should be designed". Could you give me some guidance into a servo controller circuit? I have only found this Adafruit 16-channel module, which is quite expensive. I'm sure there must be a simpler way to drive just three. Thanks for article. There is a point i dont understand which is if (count >= (on_time+(200-on_time))). on_time+(200-on_time) is always equal 200 which is our period but when count is equal to 200 that is mean 200 times interrupt occured and the total time is 200 * our timer time. is there a mistake?